Bellastagia's Olde Tyme Lunar Carnival and Midnight Circus! The faded yellow paint of the words peeled in some places on the sign post and showed its age. It sunk one inch after another into the soft wet earth of Brakmar's Mourning Wood as a shirtless Strong-man swung his mallet into the head of the sign over and over again until it was firmly set into the ground. He wore striped trousers of an off blue and white reminiscent of the same fabric of the tents set up behind him. The sun was setting and little fairy bottles began to shimmer as their inhabitants, strung up as decorative lanterns on streamers overhead, began to awaken for another night of wonderment. Swinging the mallet up over his shoulder he turned his bare upper half, covered in a multitude of tattooed eyes from his fingertips to the top of his bald head to note a giggling dark brown furred Ecaflip sitting in a ticket booth. He'd give a small bow to her and heft his mallet up to his shoulder. In turn, She produced a small violent lace fan and began flittering it at herself and hiding the lower portion of her painted ruby red lips in mock embarrassment. There was an almost...unsettling lack of emotion between this exchange as if they too were but players in the shows taking place under the big tops further down the midway. 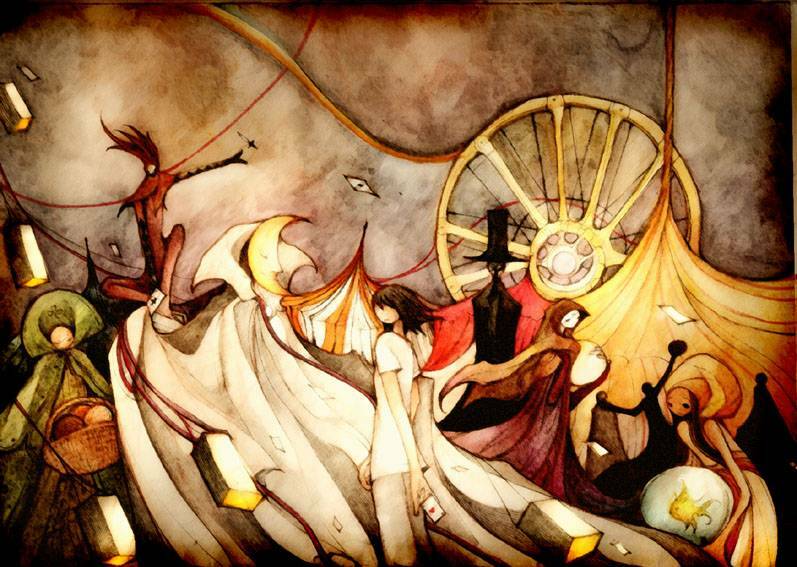 Carnival barkers and painted faces came out of the growing twilight smiling just a little too wide to be natural and the shades of orange, purple, and green emanating from the lanterns above put an aetherial pall over the whole of this so called 'Midnight Circus.' Trool faire this was not, Art Nouveau posters of corset and petticoat wearing girls and tall angular men were pasted on every stall and tent flap, promising ones hearts desire. There was certainly magic in the air for all that found themselves in the foggy moors of the Mourning Wood that night. No one had announced their coming, nor had seen this magnificent menagerie of the macabre even begin setting up their wares. It was simply there as if it had always been there and perhaps it may even leave as though it had never been there at all. A Cheshire grin and bright yellow eyes would greet all comers, The Ecaflip waiting patiently at her post ready to grant entry to those seeking out secrets, unspeakable delights, shocking performance, or perhaps just some place to keep warm out in the cold of the wood that night.